1. Single implants stand alone, while a bridge requires support from adjacent teeth. Whereas a bridge requires the teeth on either side of the missing tooth to be filed down to accommodate the dental work, a single implant is independent and gets its own support from the jawbone. This is good news for people with a missing tooth who have otherwise healthy teeth, as the integrity of the surrounding teeth does not need to be compromised for an implant. 2. Implants help preserve your jawbone. One problem with bridges is that they do nothing to replace the root from the missing tooth, and the bone that used to surround the root can begin to deteriorate and weaken, which can cause bigger problems later in life. An implant acts as a replacement tooth root, interacting with the jawbone and keeping it from shrinking away. 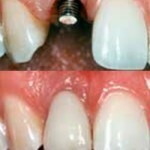 This in turn provides greater stability not only for the replaced tooth, but for the teeth adjacent to it. 3. A bridge may make sense in certain situations, but you may opt to have an implant anyway. If the teeth on either side of your missing tooth are in need of crowns to begin with, you may think that it makes sense just to go with a bridge for replacing the middle tooth. During your assessment, we will discuss whether an implant may be the right choice anyway, helping to reduce the amount by which the replacement tooth has to rely on its neighbors for support. 4. An implant may produce the most natural result, both aesthetically and medically. Dental implants look so much like natural teeth, people who see you smile will probably not know the difference between your implant and your other teeth. While bridges can often look natural, the best chance of getting the most attractive result lies with implants. In addition, the implant tricks the jawbone into thinking that a tooth root is still there, which is a better situation overall for the health of your mouth.